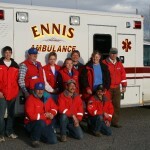 Ennis Ambulance is looking for volunteers. If you are interested feel free to stop by our business meeting on the first Tuesday of the month at Ennis Town Hall at 6 pm. Also check out the Ennis Ambulance Page for more information.